Galway East Tourism - Caheroyan B&B in East Galway, West of Ireland.Galway East Tourism - Caheroyan B&B in East Galway, West of Ireland. The manor house itself has been recently refurbished to reflect its history and importance to the locality of Athenry and visitors from further afield. It is set amidst the fields of Athenry on 70 acres of organic farmlands and 30 acres of woodlands and offers its visitors an opportunity to relax and experience some of nature?s finest treasures. 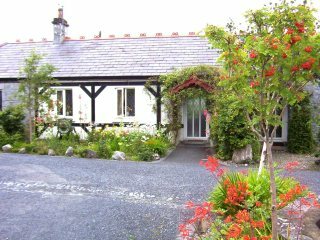 This idyllic location is only 25 minutes drive from Galway City, 20 minutes from Clarinbridge ? home to the world famous Oyster festival ? and 45 minutes from Ballinasloe, home of the renowned Horse Fair. We are well served by a public transport system which includes both bus and train, with Galway Airport just 7 miles away, and Ireland West and Shannon International Airports, just one hours drive. So, on a final note, contact us and let us make your stay in the West of Ireland an accommodating and memorable one.